talesfromjakarta: Who's the World's Greatest Mom? 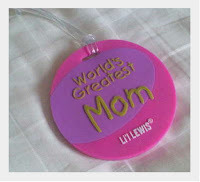 Who's the World's Greatest Mom? ..... I am, says him. He bought me an expensive purse from his business trip to Singapore recently but what's more touching is a luggage tag that he hung on the paper bag which says 'World's Greatest Mom'. Sweet, huh? Well, that's Dear Hubby and things he does that'll definitely make my day. After spending a rather short weekend here, Dear Hubby went back to Jakarta for work again. My life is then back to the usual. No more parties, no more going places, no more meeting people. A quiet life, just me and baby.